The first time I dined at Bulla, with a steady stream of tapas arriving at the table to be shared amongst new friends, I was hooked. It’s since become one of my go-to destinations for everything from weeknight book club meetings to hours-long girls’ brunches. After two memorable brunch experiences, a return trip for “research” was certainly inevitable. There’s no wrong time to visit, but brunch hours come with definite perks. Served Saturdays and Sundays from 11am-4pm, brunch includes bottomless mimosas and sangria ($18) plus an extensive $27 three-course prix fixe menu option. Delicious sangria is a deal breaker when it comes to Spanish tapas restaurants. Thankfully Bulla doesn’t disappoint. The classics are here (red and white sangria) alongside a refreshing and light sangria rose and a unique sangria de cerveza (made with Ommegang Witte wheat beer, St. Germain, lemon juice and pear puree). Classic mimosas are served, along with wines by the glass and bottle, six cocktails and a selection of draft beer. If you’re committed to sangria and/or mimosas and want to try more than one flavor, the $18 bottomless deal is a no brainer. Sangrias range in price from $8-$11/glass so it’s worth the splurge if you’re sipping one of the pricier varieties. FYI, there is a time limit of 2.5 hours from the time of purchase. Dining tapas style always requires a strategy that comes down to a simple question: are you willing to share your food? Tapas are, by nature, communal dishes designed for sharing. But it’s ok; you don’t have to if you don’t want to (and in the case of the churro s’mores dish, you won’t wanna—more on that later). If you are sharing, plan to order 1-2 dishes per person, ideally a mix of small plates and heartier larger plates. Another option is the stellar brunch prix fixe. The $27 menu includes a three-course meal comprised of a small plate, a larger plate and a dessert. There are five to seven choices per course. This option works well regardless of your choice to share or not to share. For this particular visit, we shared an assortment of dishes: the verde salad, garbanzo frito, ham croquettes, avocado toast, braised pork hash, grilled octopus salad, pumpkin crème brulee and churro s’mores. From the fresh preparation (tapas come out as they are prepared) to the complex taste of each dish, freshness is a hallmark of Bulla. The verde salad combines kale, asparagus, Brussels sprouts, citrus, lemon maple dressing and Manchego cheese for a dish that expertly balances bitter, bright and mild flavors. This is the kind of delectable green veggie salad I can only aspire to make at home. 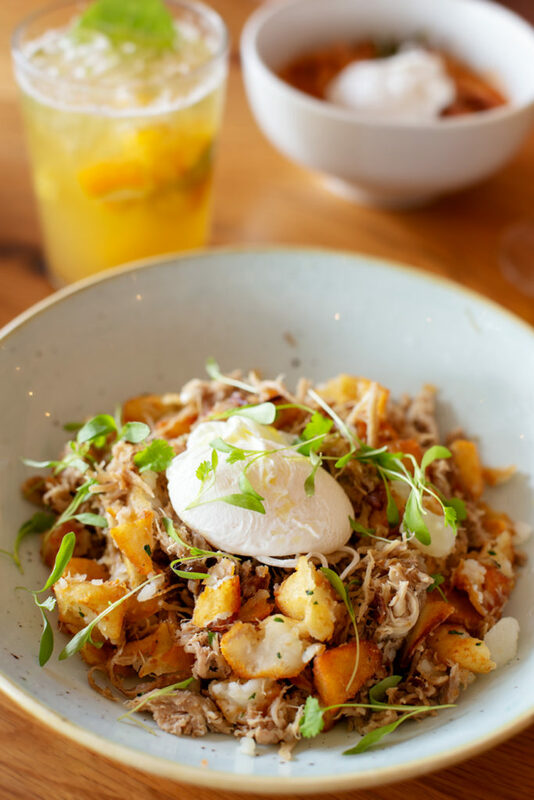 Other shareables like the garbanzo frito (a warm chickpea stew with chorizo, kale and a poached egg) and braised pork hash (a full-size dish with braised shredded pork, crispy breakfast potatoes and a poached egg) are pure fall comfort eats. The avocado toast (fyi, it comes with a lot of shredded cheese on top) and ham croquettes are best as individual servings or sharing amongst two people. I could have eaten the fig jelly accompanying the croquettes by itself with a spoon. The octopus salad always has been one of my favorite dishes at Bulla, this time served with fresh cucumber, tomatoes, red onion and croutons. For dessert, don’t miss your chance to savor the seasonal pumpkin crème brulee (the ultimate love child of pumpkin pie and crème brulee) topped with vanilla ice cream. And while Bulla’s churros con chocolate is good, the churro s’mores is on another level. A melty Hershey’s chocolate bar and torched marshmallow come sandwiched in between four mini churros. Trust me, your life won’t be the same after you’ve tasted it. Brunch is served Saturdays and Sundays from 11am-4pm. Check out the full menu and brunch prix fixe here. 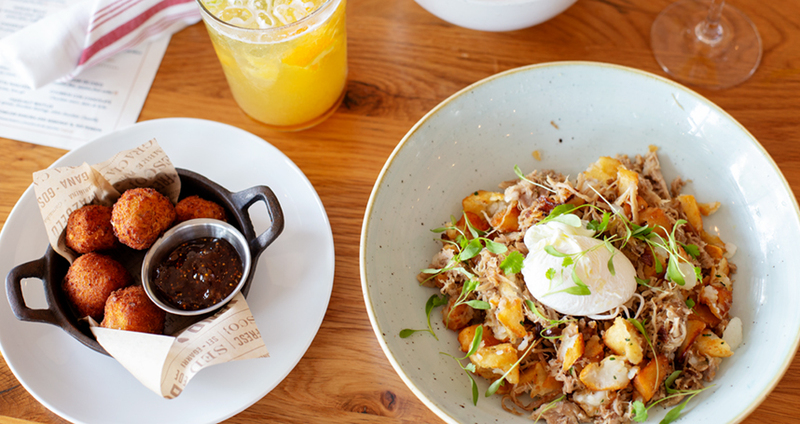 For more brunch ideas, read our guide to the Best Restaurants for Brunch in Orlando and check out the rest of our Brunch Buzz series. Stephanie Patterson is the editor of Orlando Date Night Guide. She’s a talented professional food and travel photographer and writer with a passion for creativity, the beach and great eats. When she’s not taking photos or writing, you can find her exploring the state for her Florida travel blog, Travel Taste Click. Find her online at www.spattersoncreative.com and www.traveltasteclick.com. oh hell yes! Bulla is actually one of my favorite places in Orlando, and people have always only told good things about it. Too bad I’ve been missing weekly visits lately because of my job.